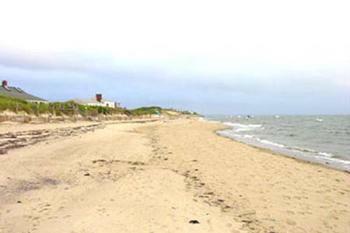 Sunken Meadow Beach is another great bay side beach; the beach is a bit steeper than some of the other bay beaches. This is a great spot for surf casting at twilight; you can enjoy the sunset at the same time. The water temperature is in the 60 to 70 degree range in the summer, and like all bay beaches, this is ideal for young children especially as the tide goes out. There is limited parking at this beach, with only about 10 spaces (depending on the sand drifts) This is a town beach, and the Town of Eastham charges $12 per day for parking. Stickers are available for $50 per week, $90 for two weeks, or $125 per season. Stickers can be obtained at the natural Resources Building at 555 Old Orchard Road, or Sunday only at the First Encounter Parking Lot.